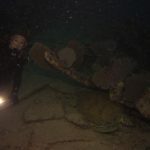 The wreck of the Benwood is a very popular dive site. The Benwood sank in 1942 after a collision with the Robert C Tuttle. Both ships were running ‘blacked out’ to avoid being spotted by enemy U-boats. Unfortunately the Benwood came off worse after hitting the Tuttle and sank in 25 – 45 feet of water. She was also used for target practice by the air force and the damage to her decks is apparent. Today she is a spectacular dive for open water and advanced divers with the stern facing shoreward in 25 feet of water and her broken bow facing out to sea in 45 feet of water. If divers want to get more depth there is a ridge off her bow, locally known as ‘the elevator’ that goes down to 80 feet. This wreck is covered bow to stern in large schools of fish. Our suggestion to our divers who are taking photographs is to stay still and let the fish come to you and you will be surrounded in no time particularly at the stern. We also use this as one of our night dive sites. During darkness you will see turtles and eels swimming and lobsters scurrying around for food. You will also witness Parrot fish making their cocoons in the skeletal spars of the ship. Scientists think the cocoon masks their scent, making them harder for nocturnal predators, like moray eels, to find. The mooring balls are all off to the side of the wreck. During the dive brief we will advise where on the wreck we are moored. As always our suggestion is to swim toward the front of the boat and follow the mooring line adjusting your buoyancy as you reach the bottom. Take note of where you are located in relation to the wreck and take note of any particular features of the wreck that will help you identify where you need to leave the wreck to get back to the mooring line. Its personal preference which way round the wreck you go and where the mooring line is. You can navigate around in 30 minutes. 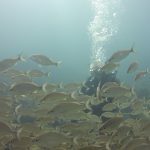 For the night dive we suggest that you adopt the same dive plan as you would during the day. Being a night dive we will have a light suspended underneath our boat for easy reference. Divers must be have a primary and backup flashlight. We provide all divers with a glow stick to attached to their tank. We often see turtles on this dive site and they can surprise you by swimming out underneath you.